After a close come-from-behind 21-13 squeaker last week against San Diego St., Notre Dame, no doubt inspired by ol' Coach Holtz's pre-game passion-plea, stormed out of the tunnel to take a 21-0 first quarter lead and then "held on" when the rains came to register an impressive 35-17 victory over archrival, rival Michigan. 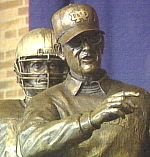 In a game which saw Holtz (and his 1988 Championship Team) honored and current Coach Charlie Weis injured (suffering torn knee ligaments after a sideline collision with Irish defensive end, John Ryan) the Irish win was aided greatly both by divine intervention and Michigan ineptitude, the later in the form of six costly turnovers. Although Michigan won every statistical battle (except, of course, in TO's and TD's) and arguably had more talent, the Irish made every play they needed to make when the game was on the line. Indeed, due to Wolverine fumbles, the first two Irish scores (a 2-yd. run by Robert Hughes and a 10-yd. catch by Duval Kamara) were on drives of 11 and 14 yards respectively. The third Irish TD, on a beautiful 48-yd. bomb from Jimmy Clausen to ND's new Golden Boy, speedster Golden Tate (who followed up last week's 6-catch performance with a 4 grabs for 127 yds. game Saturday) quickly made the score 21-zip, and appeared to put the game out of reach. But the stubborn Wolverines had other ideas, registering three 2nd-quarter scores of their own to narrow the halftime gap to 28-17. In fact, with Weis injured, and the Irish no longer able to throw the ball due to the driving rain, Michigan threatened to take over the game in the 3rd quarter, moving the ball to the ND 5. But just when they were about to narrow the score to 28-24, Michigan coughed up the slippery pigskin once again. And any thoughts of a Big Blue comeback were finally laid to rest early in the 4th, when Irish middle linebacker, Brian Smith, scooped up the forth Michigan fumble and raced 35 yards for Notre Dame's last touchdown and the games final margin. While Notre Dame's offensive statistics were not great (indeed Saturday's stellar stats including Smith's two fumble recoveries and David Bruton's 15-tackle, one INT day, belonged to the defense) the fact that they did not commit any crucial turnovers and also did not allow any sacks for the second straight week (after giving up a record 57 sacks last season) was huge. Robert Hughes (19-79 yds., 2 TD) led the improving if unspectacular rushing attack, while Clausen's numbers (10-21, 147 yds., 1 TD) would have been much gaudier if not for the rain-drop drops. Still, if Coach Weis wasn't the happiest man in Notre Dame Nation Saturday, he was certainly the happiest coach I've ever seen after suffering a torn ACL and MCL in his knee. "Upset? For the first time in my life, I feel like an athlete!" Weis proclaimed, absolutely beaming. "Tommy Brady now has nothing on me!" "Did you ever consider leaving the sidelines for treatment?" a reporter asked. "I was afraid Coach Holtz (who was on the sidelines, Saturday) might take over if I did!" he joked. Fortunately, after a four game winning streak, Weis' job is no longer in jeopardy. Although the beautiful statue of Lou (unveiled over the football weekend) will remain, Holtz will be back in Bristol next week, engaging the fans of ESPN. But it was great to have him back for one game, as his talk proved that, even on the darkest of days, the Lady on the Dome will beam too—if only She is asked. Great recap! I was at my Fourth Degree Exemplification for the Knights, but still got to see parts of the game! What a great game! Go Irish!